I’m (obviously) quite far behind on my mini-reviews, but a day of film-screening leaves me wiped by the end of the day. I’ve been tweeting some thoughts, but here are my capsule summaries. Starring Catherine Deneuve and her daughter Chiara Mastroianni, this musical(!) set in France, spanning decades from 1964 to the 90s, was extremely enjoyable. When asked “why a musica’l in the Q&A, Honoré claimed that he is not comfortable writing about love and it was easier for him to have his characters sing during the emotional moments of the film. Not a typical musical, there are no big theatrical moments, or much dancing. Just characters, walking down the street (or playing billiards) and singing about their feelings. Well, things are off to a great start. I saw four films this weekend and here are my thoughts. Here’s a shot from the Q&A after the screening. 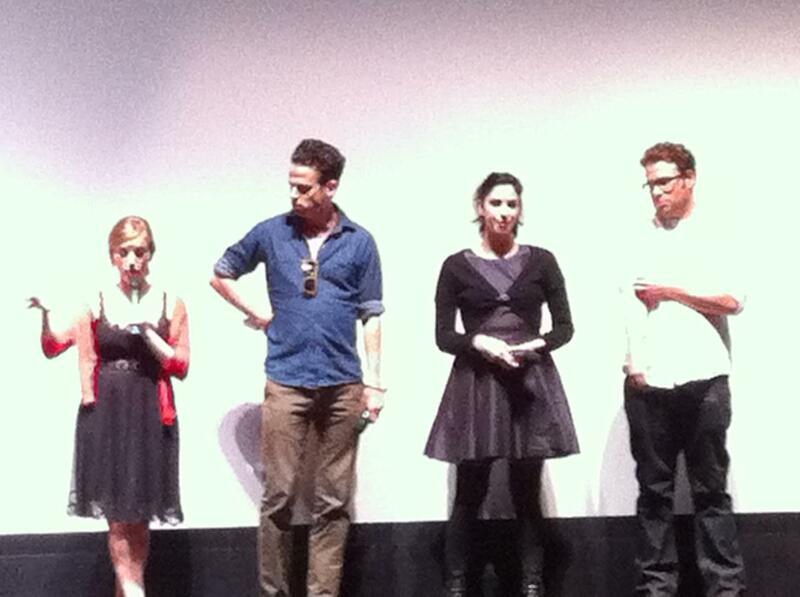 From L to R: Sarah Polley, Luke Kirby, Sarah Silverman, Seth Rogen. We attended our second screening at the TPFF last night, the film “As the Poet Said”, a lyrical documentary about Mahmoud Darwish (1941-2008). The film consisted of footage of the various places he’d lived and worked, with poets reading from his work, both in Arabic and in various translations, including Hebrew, French, English, Portugese, Kurdish, and Spanish. The score was mainly piano and harp, both women improvising music based on his poetry. The tyrants’ fear of songs. Her name later became… Palestine. My Lady, because you are my Lady, I deserve life. This was my first exposure to Darwish, and I plan to read more of his poetry. Zouheir wants to get a book of his work in Arabic, but I will have to settle for an English translation. This is, in fact, what made the film a little awkward for me. While everything was subtitled, there is so much lost in trying to match the reader’s intonation and expression with the translation. When I mentioned this to Zouheir, he confessed to closing his eyes from time to time so that he would not be distracted by the subtitles. This film was not so much a documentary but rather an homage to the life of Darwish. We are not left with facts about him; not even his birth and death dates are presented. Rather, we have a collage of his work on a backdrop of visuals from his wanderings and an intense score that seemed to capture the longing of his people. I embed a trailer for the film that gives an idea of the experience. Note that the print that was screened had English subtitles. This weekend has felt incredibly long, probably because we stuffed too much in to it. Zouheir took Michael and a band-mate up to band camp this weekend, so that pretty much ate up Friday night. On Saturday, we relaxed in our empty nest in the morning, and then headed to Bloor West mid-afternoon to pick up our TPFF tickets at Beit Zatoun and grab dinner before the opening film. We had some time to kill, so we wandered around Bloor/Bathurst area, dropping in to the By the Way Cafe for tea, and then Sarah’s Shawarma and Falafel for a satisfactory (but not great) dinner. Our film last night was The Time That Remains, directed by Elia Suleiman, a kind of memoir of living as a “present absentee” in Nazareth. It was a packed house at the Bloor, and it was interesting to see it again with a mainly Palestinian audience, as opposed to the TIFF audience last year. There were some definite cheers from last night’s audience at certain points in the film that didn’t raise a peep a year ago. After the film, we walked over to Yorkville and took in some of the Nuit Blanche sights. There were long lineups for some of the venues and we decided not to wait. We got in to the RCM and the Gardiner, the former an exciting installation and the latter somewhat disappointing. We walked down Bloor and back along Cumberland, streets closed off for the event, but by 10:30, we were kind of cold and tired and decided to head back to the subway and home. Right after mass, I hopped in the car and headed up to Lake Simcoe (Jackson’s Point) to pick up Michael from band camp. He had a great time, and parents and other visitors were treated to a brief concert before everyone left. The sound was terrific, and the students clearly enjoy the ensemble. It is something of a stretch for Michael, but he’s loving it and learning a lot. As soon as we got home, he crashed in his bed for an hour, and then came down and started practicing! This, after a weekend full of rehearsals and clinics. He’s certainly got the bug. I spent the rest of the afternoon lying on the couch trying to finish In the Woods by Tana French, an engrossing mystery that I’ve been too busy or tired to spend much time on the past few days. But it’s a great story, and I just want to get it done before I have to get it back to the library. I predict a significant plot twist shortly, so I’m desperate to get it done! Seven Quick Takes Friday – The I-love-cheese edition. I lasted 11 days on the paleo diet. I had a couple of mishaps…I ordered a hotdog at Costco without thinking, and then I had a little mishap at Union Station involving a Cinnabon, but I’ve realised that I’m just not cut out to give up cheese. Not to mention the paltry 2 pounds that I lost during that time, eating very healthily. So last night I had a little party with some Mrs. Fields cookies and Ferrero Rocher thingy’s that came in some get-well baskets for Zouheir. And that I’d been staring at for the entire 11 days. This morning, I had cream in my coffee, three pieces of raisin toast with butter and some cheese. Maybe I’d just rather be….curvaceous. Speaking of curvaceous, Zou and I went to see the Arabesque Dance Company at the Four Season’s Centre yesterday, during their free lunchtime presentations in the Richard Bradshaw Amphitheater. There were both female and male dancers, and the women were are all extraordinarily thin for belly-dancers. Zouheir leaned over to me and whispered “you can see why middle eastern men like their women full!” as skinny belly-dancers just don’t really yield the full effect. So you can see that cheese will also help me maintain my marriage. We attended a screening of The Passion of Joan of Arc at the Bell Lightbox on Wednesday. A silent film by Carl Theodor Dreyer, it was astounding, even taken on it’s own. But the two screenings were accompanied by Richard Einhorn’s oratorio Voices of Light, performed by the Toronto Consort and Choir 21. Einhorn wanted to compose something based around Joan of Arc, and around that time a print of the film was discovered in a janitor’s closet in a mental institution in Norway. He decided to write music to accompany the film, and this is what was presented at the screenings. It was incredible. The beauty and emotional weight of the film was masterfully underscored by the oratorio. The vocal part was in Latin and Old French, and not meant to really be understood by contemporary audiences, although I recognized a lot of the Latin. Zouheir and I talked about it well into the night, and more the next day. Apparently Dreyer was one of the early filmmakers to use a lot of closeups, as well as kind of kooky shooting angles. David Fallis, the conductor for the screenings, held a Q&A afterwards and talked about the film and the process of coordinating the music with the visuals. A very enjoyable evening, our first Lightbox screening post-TIFF. Michael heads up to the Hannaford Youth Band camp this weekend for lots of playing and a clinic with Glen Gould School tubist Sasha Johnson. He’s fighting a cold and I kept him home from school today to rest before the weekend. As it turns out, his school music teacher’s daughter (trumpter, out of high school for three years) is also in the band and we’ll be giving her a lift to and from camp this weekend. We also have tickets for Sahtain! A Traditional Palestinian Brunch on Sunday, followed by films and discussion with directors, but I will probably have to skip that to pick up Michael from band camp. This Saturday is Nuit Blanche in Toronto. I attended it in the past, but this year we’ll be on Bloor Street and the opening night of TPFF, so my plan is to wander around the Avenue Road/Bloor area and drop into some of the installations in that area. I’ve downloaded a free app for my iPhone which will make finding events easy. Zou goes back to work on Monday. His surgery and recovery has been better than we could have anticipated and he’s feeling great. He’s sleeping well, and keeps marvelling at how the lack of pain/discomfort has rippled through so much of his life. He is anxious to start exercising, which his surgeon told him not to do for six weeks. He may start swimming to at least get himself moving, now that his incision is completely healed. The only issue is that he’s been having some headaches, but he attributes that to lack of exercise, or possibly a slightly higher blood pressure than is normal for him. But otherwise, all systems are go! 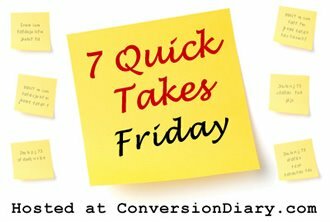 For more Seven Quick Takes, visit Conversion Diary.